Reductions available for large groups and for those wishing to take catering - please contact owner directly to discuss. Groups of 12 or more will be charged full agreed amount if numbers are reduced less than a month prior to arrival date. 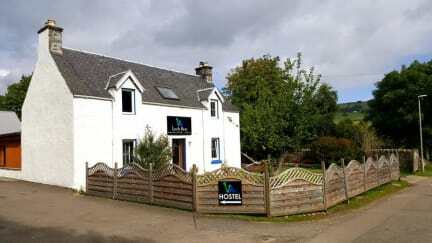 Loch Ness Backpackers is your Highland home away from home. Owners Patrick and Nikki and their team provide a warm welcome in all weathers, with free tea and coffee, a wood burning stove, a well stocked bar, large guest kitchen and lots of friendly smiles and conversation. The farmhouse itself dates back to the 18th century. You can read about the original owners on the wall in the living room. Nowadays, it retains its charm but has been modernized to ensure that you get a good night’s sleep and a nice hot shower in the morning before you head out to explore the spectacular surroundings. The staff was really pleasant, telling us about the walks around the Hostel and so on.. Great bar in it, with a great bartender and local beverages ! The Hostel is really clean, 30min by walking from Urquart Castle, or 3min by car.. We recommend it !! Personnel très agréable et accueillant. Ambiance cosy à coté du feu. De très bons renseignements pour faire des ballades. Courrez-y tous! Very warm welcoming and nice location in the city centre. Kitchen would need a refreshment and is a bit messy and not really clean at some moments. Rooms and sanitaries are clean. I would recommand this place. On y est un peut coincé car il y a très peux d'espace partout mais ce Backpack est très chaleureux. 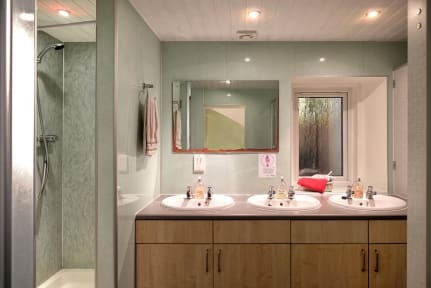 Quelques soucis avec la propreté des douches mais le reste est nickel. 7 lits au lieu des 6 indiqués sur la réservation mais ça ne fait pas grande différence. Petite auberge de jeunesse tout près du Loch Ness, personnel accueillant. Bon auberge de jeunesse. Accueil agréable et localisation dans une jolie zone résidentielle, à 30 minutes à pieds de l'Uquart Castle. L'ensemble est un peu vieillot mais reste propre. Bien pour des routards.